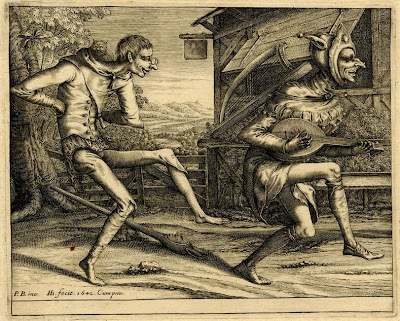 Two fools dance toward the right while playing and grinning; behind them an inn. Engraving made by Hendrik Hondius I After Pieter Bruegel the Elder,Dutch, 1642. Minister 1: Future voters are in danger of discovering that their planet is screwed if we don't reduce atmospheric levels of CO2 below 350 p.p.m. immediately. Minister 2: If they figure it out, they will surely insist that we do something to protect their planet. Minister 1: (Standing) That would mean not taking the hydrocarbons from the ground and belching them into the sky. (Pounds fist on table) We can't have that! Minister 2: (Mischeviously) If we want to keep enjoying the easy money the energy companies bring us we can't let the kids figure it out. We need to nip these kids in the bud with an old fashioned propaganda campaign. It's right there in section 4.6 of the Alberta Provincial Energy Strategy. The government is going to "work within Alberta's education system to facilitate a flow of age-suitable information about the energy industry, it's importance, and its future". Like Stelmach's leadership woes, they think it's a communication problem. Those kooky kids just don't understand how trashing the planet helps keep our taxes low. Don't hate us kids, they say, we want you to think we're trying really hard. Didn't you see us waste that $2 Billion on Carbon Capture and Storage? It might even work someday. Leave the carbon in the ground. It's already sequestered for free. Don't be manipulated by the government. Think for yourself. They want to trick you on dirty energy so you won't make your parents vote for somebody else. Somebody who actually cares about your future. The government's scared of you because you have more power than you realize. You can teach your parents about dirty energy and get them involved. Even though you can't vote, you can change the world. You'd better, you're going to be living here for a long time. Big energy companies want to convince you that fossil fuels are ok. As long as you stay fooled, they keep making money. Fossil fuels are not ok, but they're everywhere, and we need to stop them. Your future depends on it. Unless we stop this fossil fuel juggernaut, your generation is going to preside over the biggest loss of biodiversity and ecosystem crash in recorded history, and there won't be anything you can do about it. It looks ok now, but by the time it looks bad it will be too late to fix it. So we have to fix it now. Bonus: A serious plan to fix the problem would bring lots of money into Alberta too. And no, the problem isn't communications. First off, it's not about the money. Sure, it's the first thing that comest to mind, but money is only a tool. It's only worth what you can trade it for. Does that make the things that you can't trade money for worthless or priceless? The way you answer that question is important, because it determines whether you get tar sands and paved paradise or national parks and thriving ecosystems. Putting the economy first would suggest that a forest is worthless until it's cut down and sawn into boards. Was the forest really worthless? Let's go out on a limb here. Human civilization will flat out do better with intact ecosystems than it will by 'developing' everything. From a big picture perspective, this is undeniable. If we wreck the environment, we wreck our civilization. What else can't you trade money for? Relationships. People don't look back on their lives and wish they'd spent more time at work. They mostly look back and reflect on the quality of their relationships. If your relationships aren't uplifting, how much money is it going to take to make you happy? Trick question. 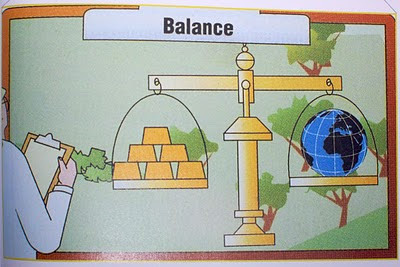 Beyond the having the basics covered, money doesn't actually correlate very well with happiness. Forget the money. Focus on improving your relationships - with each other and with nature. The payoff in terms of happiness will far outweigh the money you'd gain from that extra shift at work. No matter how you slice it, most economic activity consists of taking materials out of nature - which we all share, and selling it to individuals after some processing. Since about the industrial revolution, we've been taking more than the life on this planet can regenerate. All the energy comes from the sun anyway. If we're smart about it, it's more than we need. Instead of being stuck in the short term, scraping for quarterly profits, we can be wealthy in perpetuity by focusing our attention on relationships and maintaining the ecosystems that sustain us. It's not about the money. Does your stuff own you? Declutter. "Have nothing in your house that you do not know to be useful, or believe to be beautiful." - William Morris, Architect, instigated the Arts & Crafts movement in the 1860s. You love your things. That shirt you never wear brings back great memories. Those dusty boxes in the basement are full of former glory. The things you spent good money on, but never used are taunting you, but you can't let them go. It's time for a two-pronged attack on clutter. Prong One: Guard. Don't acquire things that you don't need and that you won't use regularly. It's easier to guard against clutter at the gate than it is to get rid of it once you've allowed it into your life. Psychologists tell us that things can only make us happy for 6-12 weeks. After that, it's just more stuff. The pain of losing something you had is greater than not getting it in the first place. That's one of the reasons you will find salespeople putting something you're considering buying into your hands early in the sales process. It's tough to give it back. This strategy will save you money as well, because reducing the things you buy will save you money without reducing your long term happiness. If you want to spend money on happiness, go for experiences instead. If you still want to buy stuff, write it down along with the date. If you still want it in 30 days, it might be something worth buying. Prong Two: Purge. Some of your unused things might fetch some cash in the right market. It takes time and effort to sell these things, but can be worth it. Sometimes, though, just getting rid of the stuff can be valuable enough. Donation bins for clothing are commonplace. If letting things go is hard, take pictures of what you're getting rid of. That way you can keep the memories, without having to warehouse the stuff. Get rid of the easy stuff first, but don't be tempted to fill up the newly empty space with more stuff. Don't feel like you have to do it all at once either. This is incremental. After the first round you'll notice more things that need to go. Proceed in waves. 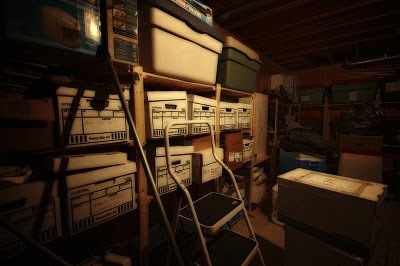 Guarding against new clutter and purging the things you don't use anymore will free up space, both physically and mentally, for you to concentrate on what's important to you now. 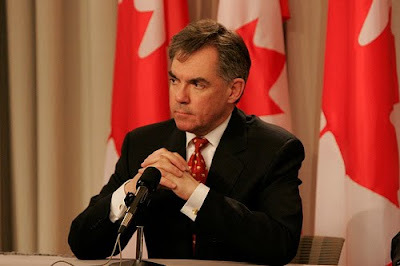 Canada's environment minister Jim Prentice announced this last week that they are further weakening Canada's commitment to Greenhouse Gas emissions. They have also indicated that they're not jumping on the Cap & Trade or regulation until our Uncle Sam to the South does. Disappointment at the weak target aside, deciding against Cap & Trade methodology is good in a way, because it means we can implement a much better system: Fee and Dividend. The difference is simple but powerful. Under Cap & Trade, corporations that reduce their emissions below the cap make money by selling those emissions credits to other Corporations. This makes extra emission reductions impossible, because those credits will get sold and used. It's the corporations that benefit. The people don't. Fee & Dividend is much more effective, and puts the power in the hands of individual citizens to make a difference. Here's how. The major sources of greenhouse gas emissions come with a fee attached, in proportion to how bad it is for the climate. That's all collected and every penny collected is redistributed evenly to people who live here. If you're an average energy user, you're no worse off than you were before. It costs a little extra, but you get that back as a dividend. If you spend less on the things that pollute, you will still receive the same dividend cheque as everyone else, giving you a nice return on your investment. Fee & Dividend also has the potential to stimulate clean energy businesses as people try to find less expensive alternatives to the carbon intensive fuels we are shifting away from. This is the kind of policy that will enrich the citizens, instead of the polluters (who would be gifted the valuable emissions credits under a Cap & Trade model). Fee & Dividend will also create continuous downward pressure on emissions, as it becomes in everyone's interest to spend less on things that now cost more. Depending on how hard the government wants to push, it's easy to raise or lower the fees (and corresponding dividends) to achieve the desired result. You can also start small, to get people used to how it works. It is a robust, nimble market driven way to attack Climate Change, and it could make you money. Ask Environment Minister Jim Prentice to implement a Fee & Dividend system to fight climate change.